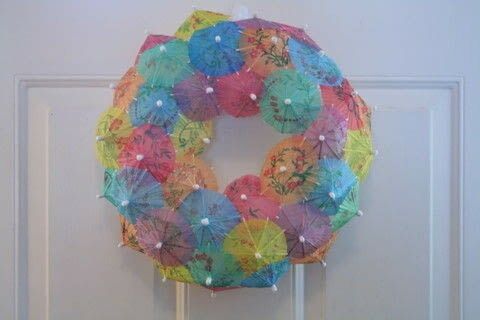 Drink Umbrella Wreath · How To Make A Recycled Wreath · How To by Christine A.
I picked up a white hard foam wreath form from the dollar store. The paper drink umbrellas came from an online company www.wesellcoffee.com but maybe you can find them in a party store near you. All you do is open the umbrellas, hot glue the underside slide piece so it stays in place, and push the stem of the umbrella into the foam form until it is covered all around. Add a loop of wire to back to hang and voila! A fun and summery wreath for your door! oooh this is sooo pretty and adorable , love it, what a great idea!!!! !